Taiwan's Hot Star Large Fried Chicken 豪大大雞排 arrives in Manila!!! Finally after so so so long!!! Taiwan's famous Hot-Star Large Fried Chicken has arrived on our shores. It has been my wishlist that someday this Chicken Chop chain would come to the Philippines, I guess my wish came true! Thank you Hot-Star Large Fried Chicken. So what's up with Hot-Star that has gotten me so hyped! Well, I guess we can start with my love for Taiwan, their lovely weather, wonderful tourist destinations and of course a haven of great food! From Taiwan Beef noodles, XiMending's famous "Ay-Chung Flour-Rice Noodle 阿宗麵線" and Hot Star Large Fried Chicken (豪大大雞排), these are all part of my must-eats everytime I visit Taiwan. 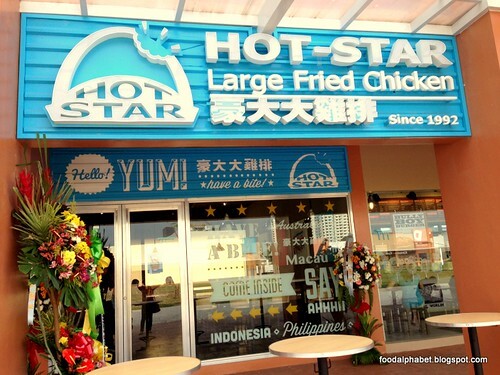 Other than in Taiwan, Hot Star Large Fried Chicken has opened shop as well in Singapore, Malaysia, Indonesia, Hong Kong and even Melbourne, so glad they're finally here in the Philippines. 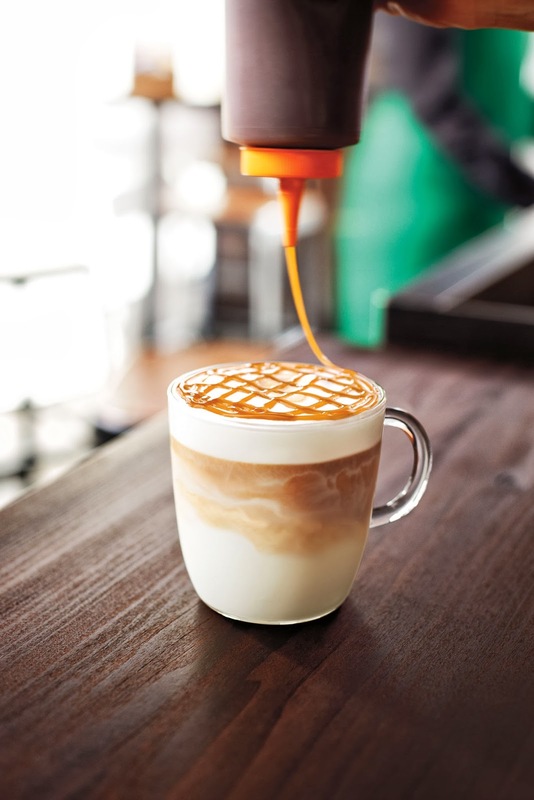 A Starbucks Macchiato Delight! + New Starbucks Cards to collect! Spring has finally set foot, and so is the warm weather. 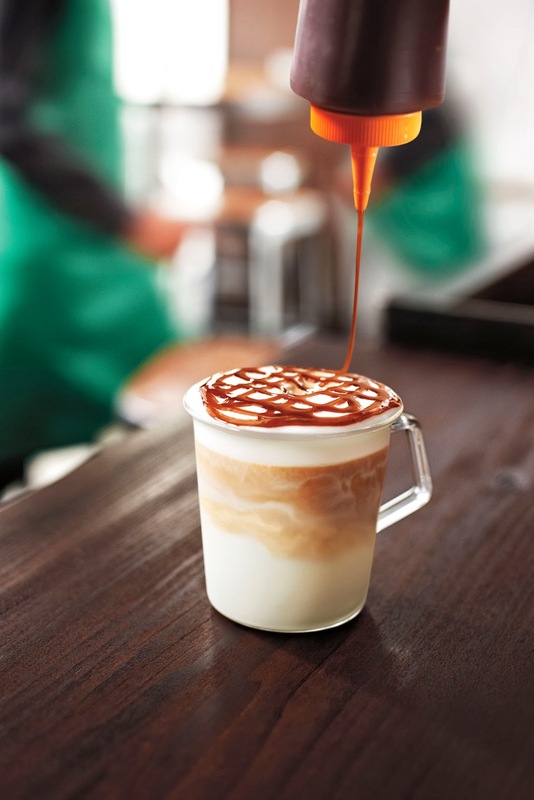 As we welcome Spring 2014, let's all join Starbucks Philippines as they make way in welcoming a new drink, and an all too familiar favorite which we have all come to love. A Premiere Card treat from The Bistro Group! An Extra Treat just for you! Avail of this offer from Mondays thru Thursdays on February 24 – March 31, 2014, just present your Premiere Card from The Bistro Group. What is a Gyoza? Well for those who have yet to encounter gyoza, which is highly unlikely, unless you have been sleeping all through these years. Gyoza is a Japanese name for dumplings, which originated from China which is why they are quite similar with the Chinese dumplings. Difference between a gyoza and dumpling? Dumplings are either fried or steamed, while gyoza are steamed first then pan fried to give that crisp crust on one side everytime you munch on it. The Gold standard in premium ice cream is finally here in the Philippines! Presenting Selecta Magnum Gold, the one we have all been waiting for. Daniel Padilla for Oishi O, Wow! Come be part of history as we celebrate Oishi's 40th Anniversary in the Philippines. In line with this grand celebration, we also welcome Mr. Daniel Padilla as the newest member of Team O! 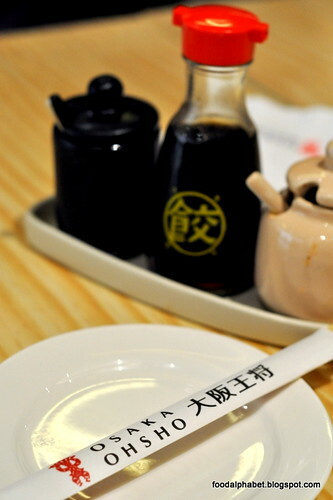 Oishi O, Wow! Joining him are the witty members of Team O! with Ramon Bautista, Slater Young and Elmo Magalona. Why Daniel Padilla? Daniel Padilla symbolizes the youth of our times and can relate to everyone, from the young once to the young at heart, he will surely bring joy to all of us by being part of the Oishi O Wow team. So I say, it's the perfect time for Daniel to be part of Team O! Labels: Daniel Padilla , featured , featured post , O Wow , Oishi , Oishi O Wow! , Team O Wow! February Half Price Deal at Diamond Hotel Philippines! One of our favorite hotels in the metro, Diamond Hotel Philippines is giving you a February Half-Price treat! Only for a limited time, get to purchase P2,000 dining vouchers for only P1,000! This is a 50% off treat! Avail of the vouchers starting today Feb. 12 up to Feb. 16, 2014. 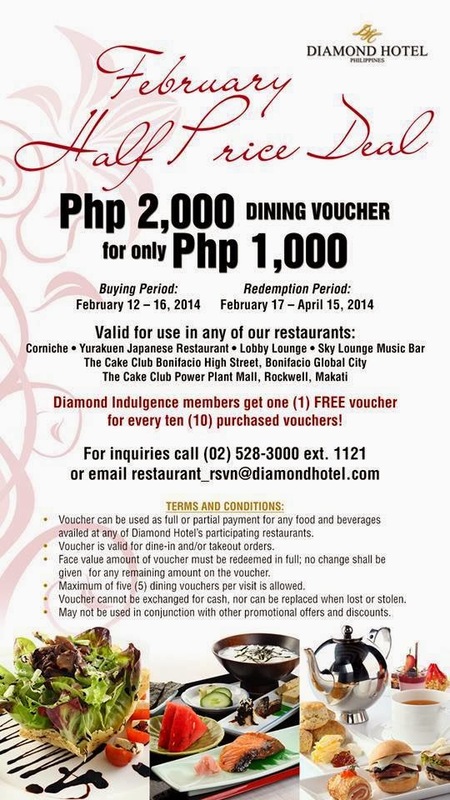 Redeem these vouchers from February 17 - April 15, 2014. Buy as much as you can! You can use the vouchers at any of Diamond Hotel Philippines restaurants: Corniche, Yurakuen Japanese Restaurant, The Cake Club Rockwell, The Cake Club Bonifacio High Street, Lobby Lounge and Sky Lounge Music Bar. You can use a maximum of 5 vouchers per visit. For more info on the said promo, please see the artwork above. Enjoy a great 50% off treat at Diamond Hotel Philippines! Get a FREE slice of cake from Starbucks this Valentine's! Get a FREE slice of cake! 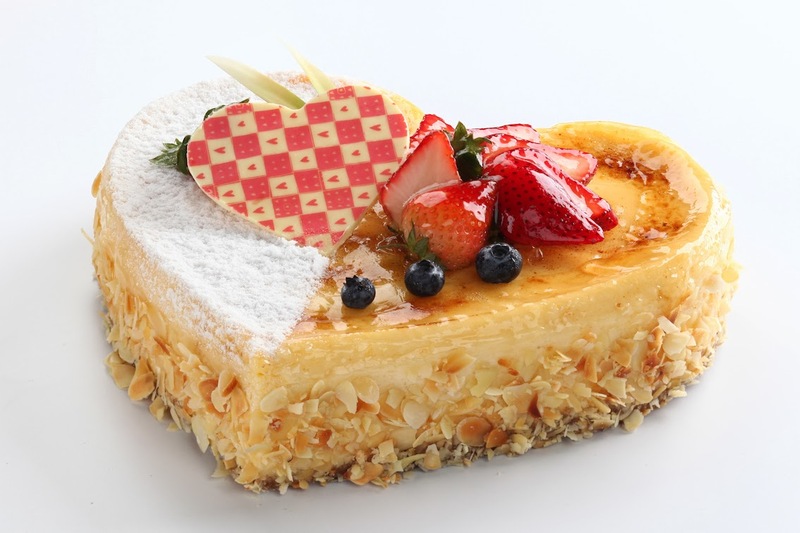 Something sweet this Valentine's is coming to get you! Starting today Feb. 8 - Feb. 14 (Valentine's day), just use your Starbucks Card to purchase any 2 of the featured drinks namely Asian Dolce Latte or Chestnut Macchiato of any size, and get to receive (1) one FREE slice of cake from Starbucks! Love is all around at Diamond Hotel Philippines! Love is definitely in the air! This Valentine’s Day, Diamond Hotel Philippines is playing love chef and has cooked up appetizing deals to ignite those loving sparks. Make your Valentine dining extra special at Corniche Restaurant. On February 13, enjoy the Pre-Valentine Dinner Buffet at Php 2,500 nett per person, inclusive of a glass of Piper Heidseick champagne. Or celebrate on Valentine's Day with a Dinner Buffet at Php 2,500 nett per person, inclusive of a glass of Piper Heidseick champagne. You have just won for yourself the Starbucks Santa Bag from of course Starbucks and The Food Alphabet! Please wait for my email on how we can proceed for you to claim your prize! Thank you everyone for joining and your support, til the next giveaway! By the way, do you know that you can get nearer to your FREE Beverage from Starbucks, just by loading a minimum of P500? Find out about it HERE. 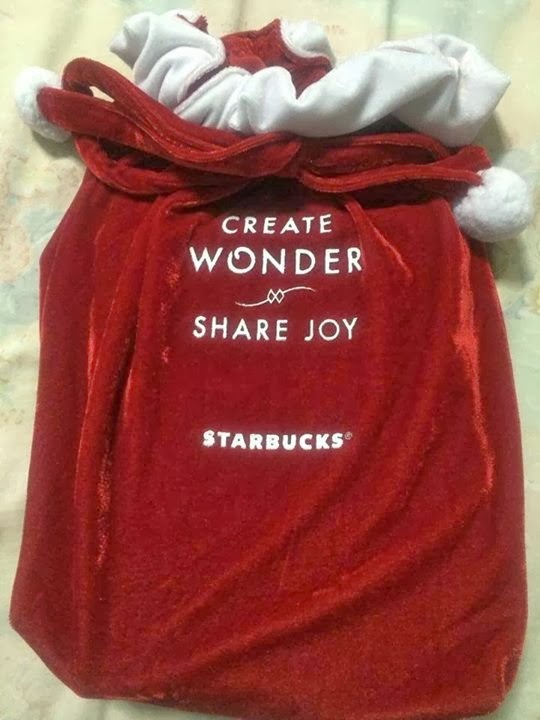 Create Wonder and Share Joy always! Finally a place where the whole family can enjoy, dine and have a great time. B&P just like home, will satisfy your cravings for home cooked gourmet meals, prepared fresh everyday! A Starbucks offer you can't refuse! 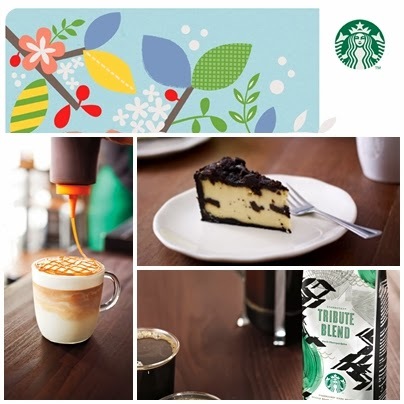 Load up your Starbucks Card starting today until Feb. 24, 2014 and earn a beverage star for every P500 load you put on your Starbucks card, now that takes you closer to your next free Starbucks favorite beverage.